WHERE IN THE L ARE WE ? 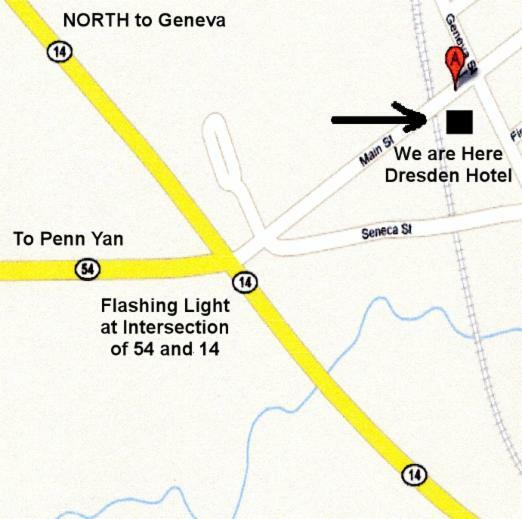 - Dresden Hotel - NY. FROM GENEVA: Drive 12 Minutes South on Route 14 (When you see the smokestacks you're almost there) at the Flashing light (Route 54) Gas Station, Diner and Ice Cream turn Left towards the Lake. We are just ahead over the tracks on the right. FROM WATKINS GLEN: Drive North 18 minutes on Route 14 (When you see the smokestacks you're almost there) at the Flashing light (Route 54) Gas Station, Diner and Ice Cream turn Right towards the Lake. We are just ahead over the tracks on the right. FROM PENN YAN: Drive East 5 minutes on Route 54 (When you see the smokestacks you're almost there) at the Flashing light (Route 54) Gas Station, Diner and Ice Cream go straight ahead towards the Lake. We are just ahead over the tracks on the right.